Fenton | Partners Real Estate Professionals, P.C. A quick view of the most influential metrics in Fenton. The city of Fenton, Michigan lies primarily in Geneese County. Portions of the city also lie in Livingston and Oakland county. It is a fair-sized community with about nine neighborhoods, making it the 96th largest community in the state. It is a somewhat racially and ethnically diverse community where English remains the primary language. It has a council/manager form of city government and a warm and welcoming atmosphere that invites visitors to become new residents and new residents to become like family. It is blessed with wonderful schools, low crime rates and peaceful quiet streets. The history of the area had its start when Clark Dibble, one of the areas first settlers, established the settlement that would become Fenton. This was done in 1834 under the name Dibbleville. The community was officially platted as Fentonville in 1837. However, in 1863 when the community was incorporated as a village the name was shortened to simply Fenton. Growth was slow but steady and the community was incorporated as a city until 1964. By this time the downtown area was in decline and the community was spurred into rather drastic urban renewal plans. These efforts unfortunately required the leveling of the historic downtown buildings. The silver lining, is that the dilapidated buildings were replaced with beautiful modern buildings. The first and perhaps the most beautiful of these buildings was the Cornerstone building. The efforts also led to the renovation and expansion of the Old Fire Hall, which now serves as a beautiful fine dining establishment. These buildings now stand as a testament to the city's devotion to it's downtown area. The community spans seven square miles of almost exclusively land area. In 2010, the population was 11,756, the population density was 1,759.9 people per square mile and the per capita income was 22,815. 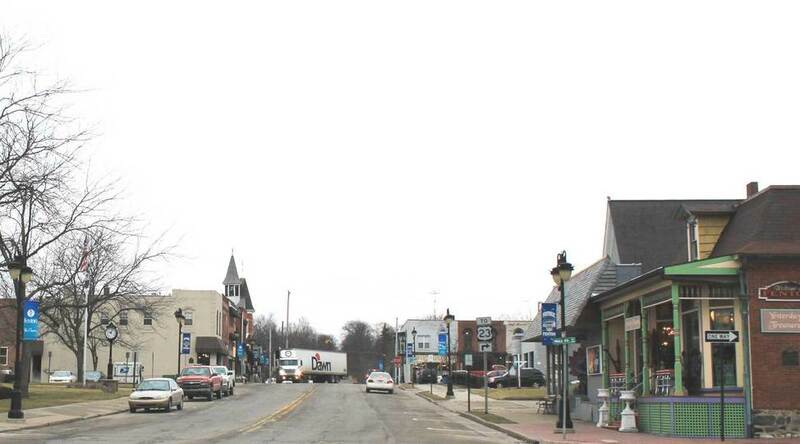 By 2013, the estimated median household income in Fenton was $42,977 and the estimated per capita income was $23,910. In the same year the estimated median house or condo value was $95,532 and the median gross rent was $774. The city has a mixed workforce to match it's mixed job market. Due to this diversity in income and job opportunities it is a solidly middle income community when compared to state and national averages. The primary school district in the community is the Fenton Area Public School District. However, portions of the city are also served by the Hartland Consolidated School District and the Lake Fenton Community School District. Public Schools in Fenton include Fenton Senior High School, North Road Elementary Schools and others. There are a number of parks in the city to encourage outdoor activities and team sports. These parks include North Shore Park, Torrey Hill Park, Township Park and others. Amenities among the parks include playgrounds, bathrooms, walking paths, boat launches, sports fields and courts and so much more. Homes for sale in Fenton come in a variety of sizes, styles and prices to suit the needs of potential buyers. Other real estate options include rental properties such as apartments and duplexes. Though they are more rare there are also properties such as condominiums and townhomes for sale or lease. To find a home in Fenton, call friendly local real estate agent (insert name here) at (insert number here) today. View our selection of available properties in the Fenton area. Check out the latest demographic information available for Fenton. Browse through the top rated businesses in the most popular categories Fenton has to offer.